Portobello mushrooms are just cremini mushrooms grown to a huge size…I have never seen them that big in France or Italy. Americans are so great at marketing that they came up with an Italian name for those gigantic cremini to make them sound interesting and appealing. At first, I was fascinated by those mushrooms, I thought they were some kind of exotic mushroom that would only grow here…I was a little disappointed to discover they are just regular cremini. Thinking about it, it’s not that important, the most important thing is that being that large you can make many interesting and pretty delicious dishes and stuff them. I love to stuff mushrooms, with all kind of ingredients. 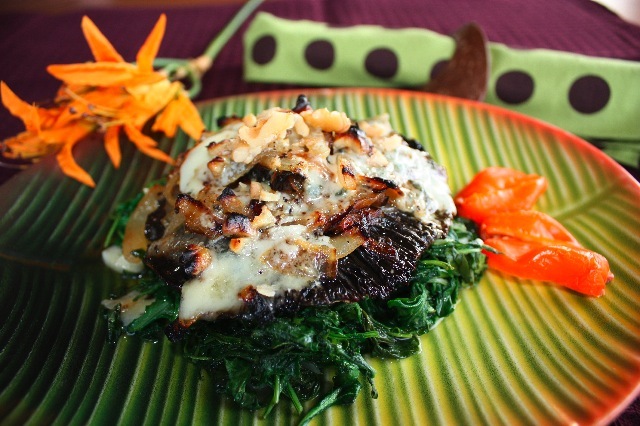 Mushrooms are low in calories and add flavor to any dish. Chop onions to make rings. Cook in olive oil until they become soft, browned and caramelized, add balsamic vinegar, stir for a few minutes and set aside. Wash mushrooms and pat dry. Sprinkle with olive oil, vinegar, salt and pepper and place under broiler for a couple of minutes each sides. Place onions on top of mushrooms, add roquefort cheese or any other blue cheese, then add walnuts, and thyme. Place under broiler until the roquefort melts. Serve with a mache salad or sautee spinach, wilted rucola or any other greens. This entry was posted by silvia on April 7, 2009 at 7:00 pm, and is filed under Appetizers, Vegetarian - dairy. Follow any responses to this post through RSS 2.0.You can leave a response or trackback from your own site.